There are certainly some reasons to criticize the Dirt Marathon. You can argue that it is a misnomer; it isn’t even really on dirt, and much of the rest of the racing world finds its mile and a half distance rather less than daunting. You might point out the less-than-stellar field (although it could have been much better, had some of the cross-entered horses opted for it rather than the tougher Turf – which doesn’t advertise its mile and a half distance as anything remarkable). Perhaps you simply find an ungraded race as part of the Breeders’ Cup event not to your taste. Many of your concerns would be legitimate. However, let’s give the race a chance to prove itself. First, the name — they seem to have dropped the ‘Dirt’ and are simply referring to it as the ‘Marathon’ — whether it will remain so called if run over a conventional dirt surface remains to be seen. Then there’s the distance factor, and there are two lines of attack here. The first is that modern American horses are simply not bred to go such a long distance. The second is that it’s not such a long distance. Both are true to a certain extent. So let us tackle the breeding angle. It’s true that there is not great emphasis on breeding American horses to run longer distances since there are simply not many notable longish races in the US beyond the Belmont. We don’t even have a ‘champion stayer’ category in the Eclipse awards, yet it is a respected category in Europe and the Antipodes. 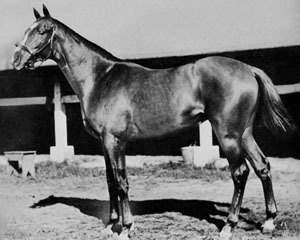 However, many of those champion stayers, like Yeats and Septimus, have plenty of North American blood in them – both are descended from Northern Dancer via Sadler’s Wells. Even the great Makybe Diva’s pedigree is overflowing with US bloodlines – Danzig, Riverman, Nureyev and Roberto are all right there – and of course there’s plenty more Northern Dancer further back. Certainly none of those names are unfamiliar to American breeders. (One might also argue that the recent emphasis, whether by design or happenstance, on producing champion milers in Europe makes those stamina bloodlines less fashionable overseas as well). There remains the trouble the distance isn’t really much of a marathon – and this argument holds a little more water. Granted, we are not going to return to the days of Whistlejacket (pictured, by George Stubbs, painted ca. 1762) when horses ran 4 mile flat races, but it’s not as though 2 miles is an unheard-of distance (and it would help to further set the race apart from the Turf if it were longer – especially on an artificial surface). The Melbourne Cup, the Wellington Cup and the Grand Prix de Paris all hover around the 2-mile mark, while the Ascot Gold Cup is 2 1/2 miles. Given that the distances for many major races have changed over time (often getting shorter, although that’s not always the case), perhaps we will see this evolve in future runnings. Finally, the ungraded status and a sense of experimental uncertainty both hang over the race, which I believe are both major contributors leading to a comparatively weak field. The $500,000 purse cannot hurt, but it’s tough to lure the international stayers (especially this close in time to the Melbourne Cup) when they can bank Group earnings elsewhere. However, given a few years to find its feet, the race should grow in status – if breeders and trainers work to produce horses who can truly perform at this distance (and if other tracks offer notable longer races throughout the year – Keeneland now cards the Fort Harrod Stakes, at 1 5/8-miles, but that’s only a first step). I like to think of the Breeders’ Cup Marathon in the context of our current economy – invest for the long term, don’t expect too much in the way of immediate gratification. I think the race would have attracted far more attention if Evening Attire hadn’t retired and gave it a name of sorts, or at least a hook to draw people. I like the distance and it’s a rare one on dirt/poly/synthetics/whatever. I’m not sure why the purse is only $500,000 though. Yeah, George Stubbs. An unfinished painting that is really his best and Whistlejacket a subject beyond compare.